Can A Fictional Character Change A Real Character? People always ask me whether it was hard to write my first book, Granny Hooks a Crook. I feel they are expecting me to say “Yes” with emphasis. I can’t lie to them and give them the answer I think they seek. Writing my first book was easy. It was done on a lark to wake me out of a depressive state. Each day I would wake up eager to start my day with the next chapter in my story. I didn’t have any thought of where the story was going to lead or whether I was going to find a publisher. All I knew was that the story, and the characters, got me out of bed in the morning and gave me reason to look forward to my day. The silliness in the story brought the silliness and fun back to me, the me, I used to be many years ago. When I wrote Granny Hooks a Crook, I have to say I probably had a bad attitude for years. I was a glass half empty person and writing made me a glass half full person. I have to credit God too because I have to think that he put the story in my head. If people would ask me if it was hard to write my second book I would absolutely answer yes. 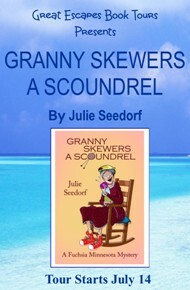 Granny Skewers a Scoundrel was hard to write because of the expectations that I thought might be out there from my publishing company, Cozy Cat Press, my readers, my friends. What if I bombed? What if I couldn’t be funny? I didn’t know where in my mind the first book came from; would the second book be as good as the first? That is, if people thought the first book was good. Critics can be very harsh. Would my publishing company accept the second book? Would I become a one book wonder? For a while writing went from being a lark, to being too paralyzed to actually sit down and start that second book, Granny Skewers a Scoundrel. It was harder writing that second book because of fear. Once I actually started the process the Granny in my head took over again. As I was writing all the critiques of my first book went through my mind like scrolling text on a computer screen. This book is ridiculous, over the top, it couldn’t possibly be real, the characters are too silly, I don’t like the animals, and the words kept scrolling in my mind. Did I want to change my writing and conform to what people would expect? Although the good reviews far outweighed the bad reviews, it is the bad reviews that tend to stick in our heads at the time of stress and deadlines. As I was deep into my story I found that I did change a little of my writing. I added between the lines a vulnerability to Granny. She hurt and mourned when someone died, and her crustiness and silliness covered up those feelings. She was stubborn when she felt she needed to be because she had to follow what her gut was telling her. Granny had to be true to herself because for many of her years she had lived under the shadow of societies expectations. She no longer wanted to do that. As I was writing I received wisdom from my character, Granny. She taught me that I have to write what is in my soul. I, like Granny, spent many years conforming to others expectations so much that I lost me. I want to be silly, weird, creative and empower others to dream and imagine, and unleash the part of them that has been lost in whatever way that will not hurt anyone else. I want others to nurture the gift that we were given that lives inside all of us. The uniqueness that lives in all of us makes us different. Embrace your uniqueness. It is creatively yours. 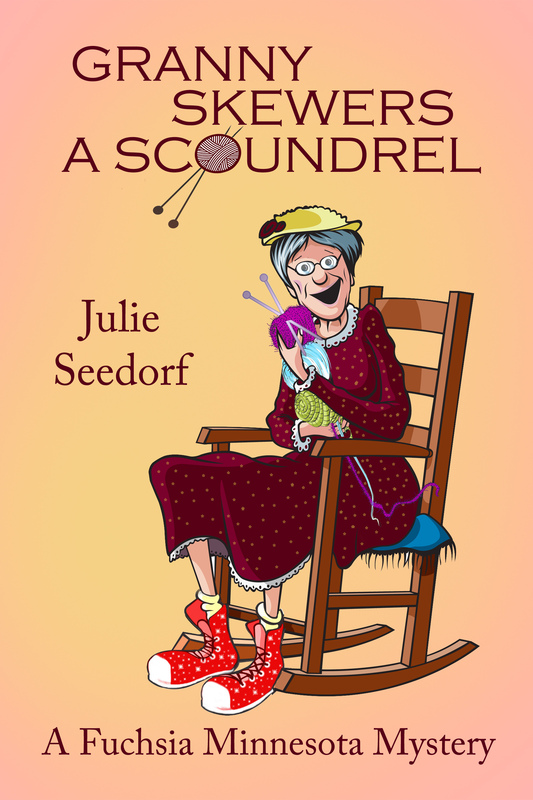 This entry was posted in Book Tour and tagged cozy mystery, Granny Skewers a Scoundrel, julie seedorf, Michele Lynn Seigfried. Bookmark the permalink. ← Gold-Diggers, Gamblers and Guns – Giveaway & Guest Post! 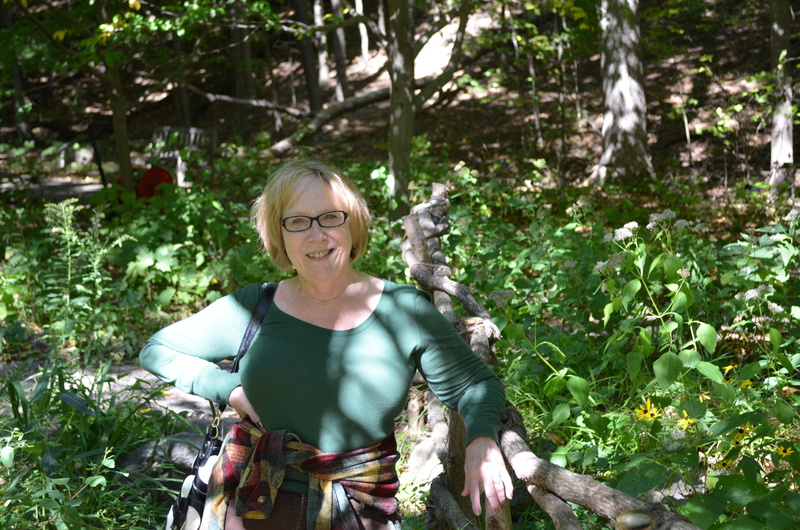 Thank you MIchele Lynn Siegried for letting me stop by and leave a guest post. My next stop on Granny’s blog tour. You are very welcome! I’m so happy to have you here today and I hope your newest book will be a great success!! Hi Julie, good luck with the new book! I found that writing the second book in a series can be a hard act to follow too. Granny sounds delightful!